Playwright Moss Hart is reputed to have said “If you want to send a message, call Western Union.” His stance, and that echoed later by film directors of such note as Frank Capra, is that theatre might entertain or explore but that work with a message to impart is destined to be boring. With Small Axe, a coproduction of The Theatre Centre and Project Humanity, Andrew Kushnir has proven Hart decisively, irrevocably wrong. What’s more, he does so using a collection of theatrical elements that often spell disaster, but which apparently (to no one’s surprise more than mine) can in the right hands be combined to make a deeply affecting theatrical experience. Here we have Andrew Kushnir, playing Andrew Kushnir in a play written by Andrew Kushnir. It should be a masturbatory disaster, but it’s not – Kushnir is so much in the work that his ego almost plays another, uncredited character with its own arc (in the best possible way). 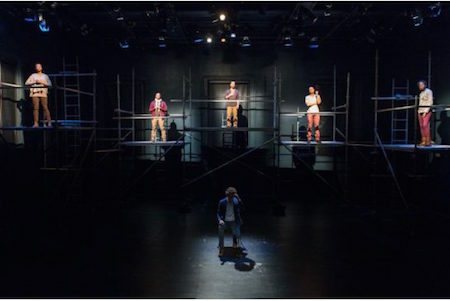 He is surrounded and surmounted, by use of scaffolding, by five actors who stand on non-euphemistic pedestals ten or twelve feet above and tell him about their experiences of anti-gay sentiment, and violence, among Jamaicans and Jamaican-Canadians. Each of the five talented actors (Sarah Afful, Michael Blake, Lisa Codrington, Chy Ryan Spain, Marcel Stewart) speaks in a variety of characters with body language and accents to match and for a while they stay where interviewees should: in the light, in the little box, and when their spot goes dark they disappear. This is more interesting than you’d expect, because the stories they tell are resonant and insightful; the historical lessons compelling. Director Alan Dilworth is very much at work even in the rigid staging, making a lot out of the smallest choices. All the text is taken directly from the interviews Kushnir recorded, and he interviewed some very, very thoughtful people. Only some of the information was new to me, but all of it was compelling in the play. Then one of Lisa Codrington’s characters breaks the form. She asks Kushnir: “What do you intend to do with these interviews you’re collecting?” At which point, the tone of the work changes. A play that seems to be about interrogating the whys and wherefores of homophobia in Jamaica turns into just as much a play about interrogating the pervasive interest of white people in packaging and selling stories that don’t remotely belong to us. In this latter portion of the play, the intervieees come down off their platforms and become subject instead of object, participating in the process rather than being part of the product. Dilworth, whose chops I admittedly questioned a little in the beginning, really shows his mastery of the craft here – the threads and strands of the work are echoed in the movements and position of characters with enormous grace. I have one complaint. Toward the middle of the play, one of Chy Ryan Spain’s characters (and he does so well with this piece of material) likens the current attitude of Canada toward Jamaica around homophobia as being like that of some arsonists – first they set the fire, and then they rush in to play savior. It’s a searing point, and I expect to quote it often in the future, but I have no way to make an attribution except to Andrew Kushnir. Kushnir recorded it, produced it as a play, and could properly be cited but the fact is – they’re not his words. I’ll never be able to credit the person who actually made this brilliant point. In some ways, that complaint exemplifies the point of the play – and points to the eventual denouement that I found so incredibly satisfying. I won’t spoil; you’ll just have to go experience this triumph of guts over glory for yourself. Performances are Tuesday through Saturday at 8pm, with a 2pm matinee on Sunday. Tickets range in price from $22 to $25. Photo of the cast provided by the company.